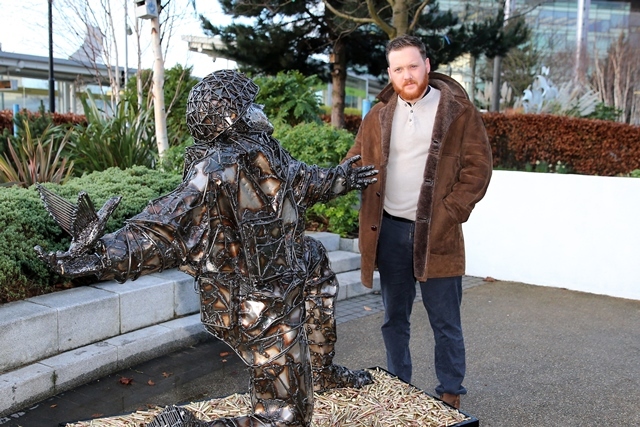 Sculptor Alfie Bradley with Soldiers of Sacrifice at Media City. Copyright Steve Crawshaw. Following an international tour, the ‘D-Day Soldiers of Sacrifice’ sculpture by Alfie Bradley is now on display at The D-Day Story. 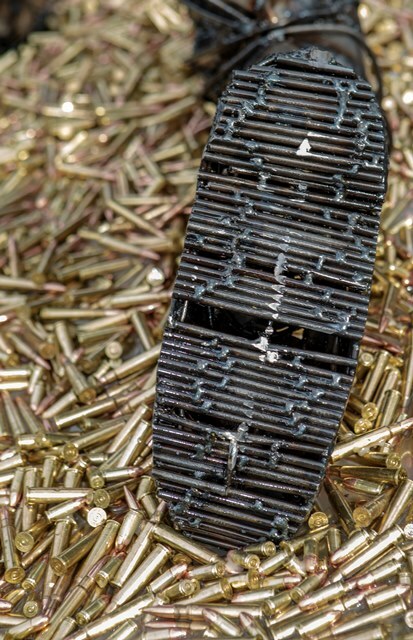 Made of steel rods, steel sheet, welding wire, resin and two types of replica bullets, the sculpture is Alfie’s interpretation of not only the high cost of war and the sacrifices made on D-Day, but the element of hope that arose from this epic event. 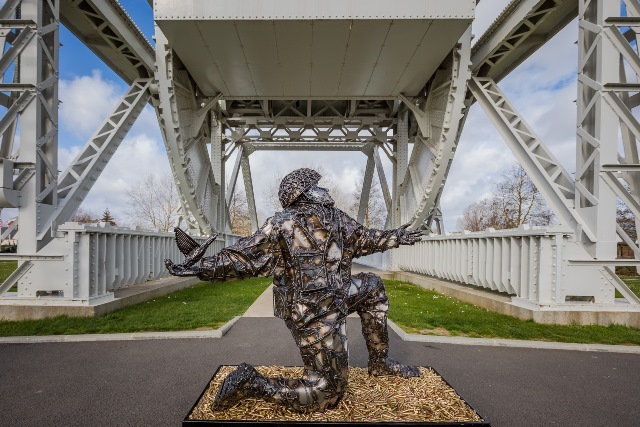 It features the figure of Den Brotheridge, widely believed to be the first Allied serviceman to die that day, kneeling on a sea of 4,413 bullets that represent his comrades in arms who also lost their lives that day. The soldier’s form is crouched down as if to throw a grenade, but instead is releasing a dove; symbolising peace and acknowledging that these soldiers’ deaths were not in vain. 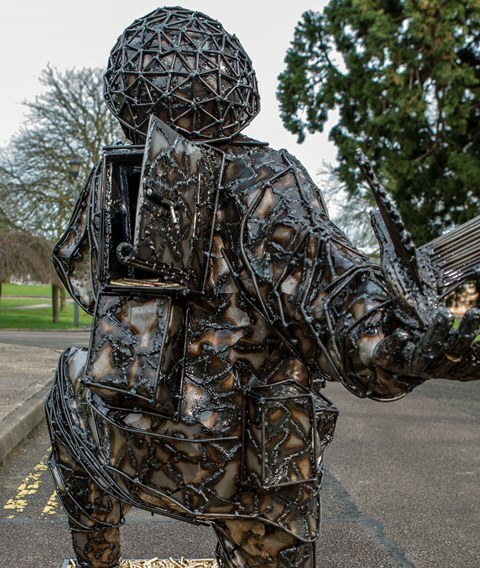 Part of the soldier’s kit on his back is in the form of an memory box where visitors can place messages to those that lost their lives, or stories of friends or relatives who took part in D-Day. Please leave a message if you wish to; if you include your contact details we will be in touch if we need any further information. We will be collating messages to display on the website at a later date. 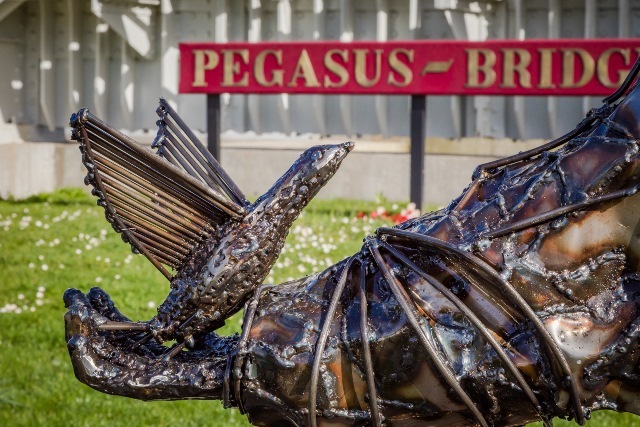 Funded by the National Lottery’s Heritage Fund, the sculpture is available for loan. Please send enquiries to: jane.barnard@portsmouthcc.gov.uk. If you are visiting the museum specifically to see the sculpture, please call first to check it is not out on loan. 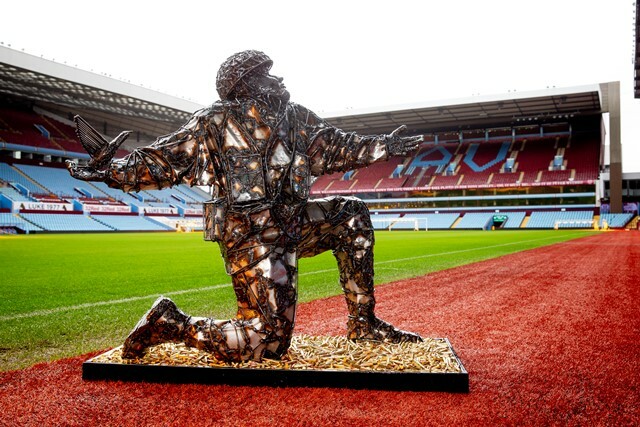 Soldiers of Sacrifice at Villa Park, to honour Den Brotheridge who played for Aston Villa. 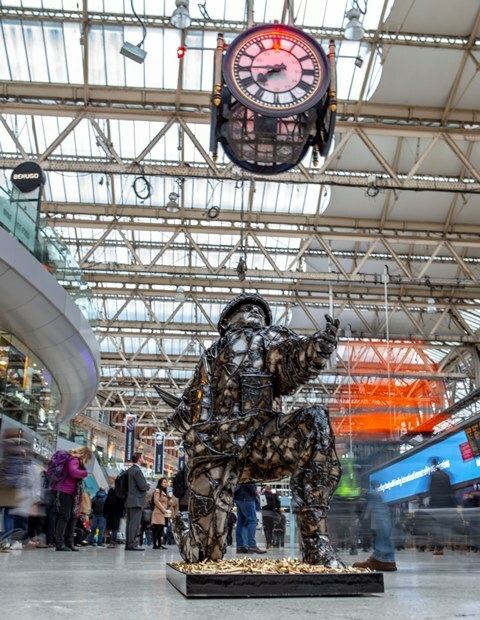 Soldiers of Sacrifice at London Waterloo station, copyright Adam Sorenson. 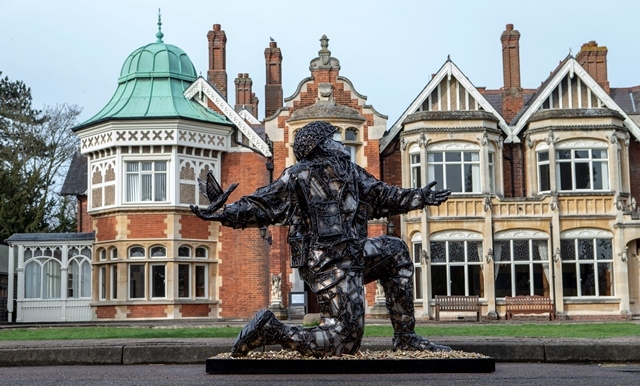 The sculpture outside Bletchley Park, copyright Adam Sorenson. Close up detailing of the soldier’s boot. Copyright Adam Sorenson. The Memory Box, photo copyright Adam Sorenson. Based in Oswestry, Alfie Bradley is the creator of the Knife Angel, created as a national monument against violence and aggression. At 28 he is the same age as Den Brotheridge was when he died. Alfie says: “This has been such a meaningful project for me… I can’t even begin to imagine how terrifying it would’ve been to land in Normandy that day… The more I’ve learnt during this project the more I realise how grateful we all should be for their heroic sacrifice.